One of the biggest problems marketers face is the rise of (not provided) results in Google Analytics. Anyone trying to look up the keywords driving visitors to their site will likely come across a giant group of visits unhelpfully labeled (not provided). These keywords are essentially in a black box. Though (not provided) initially affected only a small number of visits, the problem has become so severe that three quarters of organic search terms are now completely hidden from view. Why Does (Not Provided) Exist? In October 2011 Google started encrypting outbound clicks for users logged into their Google account. A number of browsers followed suit, including Firefox in July 2012, Safari on iOS 6 in September 2012, and Chrome in January 2013, swelling the ranks of (not provided). Just this month, Google started encrypting all search activity, even for users who aren’t signed in to a Google account. This move essentially guarantees that the majority of searches will now fall under (not provided). When Google introduced secure search, it claimed (not provided) would only affect a single-digit percentage of search users. Last year however, (not provided) accounted for 10% of visits, and over the course of 2013 that number rose to 40%. Since early September, when Google started encrypting all searches it has spiked dramatically so that 75% of search terms are now withheld. The justification for secure search is to protect users’ privacy. Google cited “extra protection” for searchers as its motive for the latest round of encryption. Some are speculating that Google’s recent extension of (not provided) is part of a company-wide pushback against accusations that it has given the NSA access to search data through the PRISM program. This privacy explanation would be more convincing if Google didn’t allow access to referrer data for its Adwords customers. It’s hard not to see the rise of (not provided) as a cynical attempt by Google to force sites into buying ads. This is just one example of how paid ads are taking over the search landscape. (Not provided) results are damaging to marketing efforts because they make creating content more difficult. Without accurate information about what keywords are driving visitors to the site (and, more importantly, to convert) digital marketers are forced to think creatively to gain insights on optimization strategies.The same goes with choosing topics to build content around. It certainly makes Google’s noise about creating lots of relevant, quality content sound a bit hollow. (Not provided) results also make it difficult to assess the effectiveness of marketing. Information can be gleaned from unblocked keywords and paid ad campaigns, but it’s impossible to know how all users are responding, especially to organic efforts. The sites that have had more than 50% of search terms (not provided) have been essentially flying blind or reliant on more creative strategies. Perhaps the biggest problem created by (not provided) is the inability to distinguish between branded and non-branded keywords. Differentiating traffic from these two different sources is essential for gauging the effectiveness of marketing campaigns, search engine optimization efforts and figuring out how much recognition the brand has achieved. When the percentage of visits that fell under (not provided) was still small, it was possible to make an educated guess about what keywords it included by analyzing the rest of your keyword data and applying those ratios to the (not provided) visits. Now, however, with (not provided) accounting for over half of visits on some sites, it’s no longer possible to make assumptions based on the unblocked keywords. The problem is that the users included in (not provided) are qualitatively different from the users whose search terms remain unblocked. 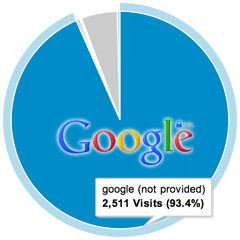 (Not provided) primarily affects users of the Google universe, Firefox, iPhone, etc. These people tend to be a different segment of users than Internet Explorer and Yahoo users whose search terms remained unblocked. It’s very difficult for the online behavior of latter group to give you any insight into the behavior of the former. Thankfully some data is available. Google Webmaster Tools allows you to see the top 2,000 search terms per day from the last 90 days, though after this timeframe the information is lost. In AdWords, however, you can also see the search terms and store them for as long as you want – another way the rise of (not provided) is pushing people into becoming paying Google customers. Marketing experts have come up with all sorts of ways to try to get around the problem of (not provided), though most are highly technical or not particularly accurate. Short of buying paid ads, looking at attribution and analyzing landing page distribution, the most marketers can do is be aware that their information isn’t perfect, continue to test and analyze new data as it comes out and hope that Google (or someone else) eventually provides a better solution.